The Beauty of a Woman BlogFest II! My trusty thesaurus lists 35 synonyms for beauty: blessing, fairness, loveliness, allure… If you bundled them all together, the result wouldn’t come close to describing the beauty in this fest. I can’t thank you all enough for participating in the second annual BOAW BlogFest. ♥ Whether you’re here as a reader, a contributing writer or both, get ready to laugh, ponder, glean inspiration and possibly shed a few tears. Contributors: If you do not see your post, it’s because I wasn’t able to locate it or it wasn’t posted by the cut-off time. Don’t worry—I can still include it! Please post your link in a comment on the registration page and I’ll jump on it promptly. 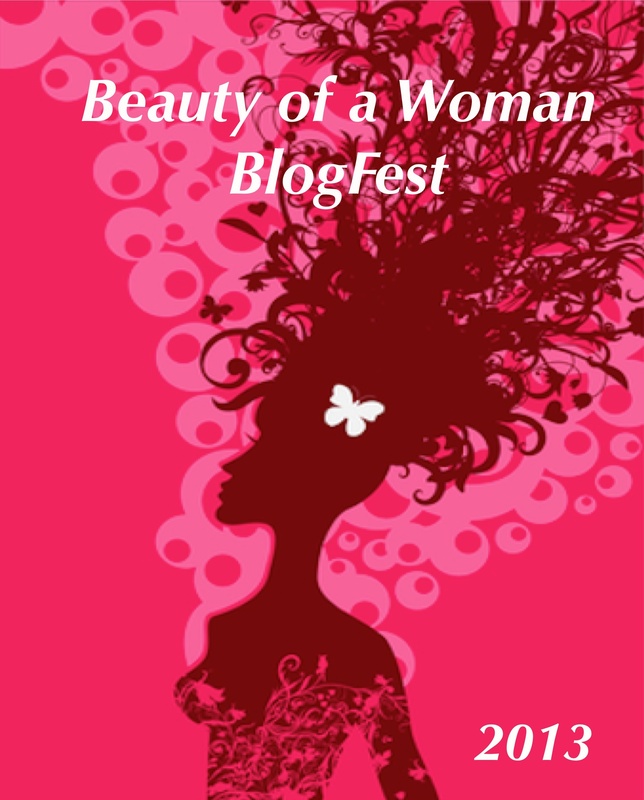 Without further ado, I’m thrilled to present the The Beauty of a Woman BlogFest II! Marcy Kennedy: What Would You Trade to Look Young Forever? Jennette Marie Powell: Beauty of a Woman: Don’t judge us by our covers! Amaryllis Turman: Beauty BlogFest 2012 – What is REAL BEAUTY? Catherine Johnson: Beauty of a Woman BlogFest and Giveaway! Jenny Hansen: Beauty of a Woman BlogFest: Do Breasts Define a Female? Jess Witkins: What Makes a Woman REDHOT? Kristine Erickson Parker: Woman, love thyself! What has struck you most about this fest? How do you define beauty? Who do you feel most embodies it? To join our discussion on Twitter, use the hashtag #BOAW. So glad you’ve joined us, Amber! It’s all my total pleasure. Thanks for joining, Renee! Enjoy, Diana! Thanks for being here. I’m so touched, Kassandra. Thank you! What fun, August! So glad to be participating plus I am going to savor these posts by everyone. Fascinating to read what beauty is to everyone – and so different in perspective.. Agreed, Donna. Thanks for contributing! Sorry to miss this year’s fest, but I am glad to be back in the land of cheese to celebrate Dad’s 87th! I try to make my way through them. Wow, you must have worked really hard doing all those links, women are strong 😉 I can’t wait to read them all and fun competition too :0) you rock! Sweet of you to say, Catherine—worth every key stroke and brain cell. lol YOU rock! What is impressing me so far is the beauty of diversity in our experiences, yet there is a common thread that links us all together. Like, Kassandra, I’m going to start at the top and work my way down this weekend. Thank you, August, for giving us a place to share our voices! What Kassandra said! 😉 You’re so right, Barbara. United and diversified. There’s so much beauty in that. I’ve read a few and am already overwhelmed, in the best sense of the word. We women GET it–beauty is so much more than what the marketplace is trying to sell us. I will spend the weekend immersing in this beautiful writing. I am proud to be a part of all of this. I know precisely what you mean. I think my goosebumps have goosebumps! 😉 Thanks so much for joining us. And, I had to laugh because everyone does this, but on #25 my name has an extra “a” in there. LOL It’s all good though! Whoops! Fixed. 🙂 Hope you enjoy the fest! Yep! It was awesome! Thank you so much for doing this. I am definitely on board for next year! http://allergictolifemybattle.wordpress.com/2013/02/21/the-beauty-of-a-woman-blogfest-ii/ For some reason my site cannot be accessed from either google or internet explorer. What a terrific list of blogs to check out! This was such a fun activity, August. One thing I’m noticing in the blogs I’ve read is how much we value internal beauty over external looks. And I love it! This is great! I only know a couple of the women on this list, so I’ve got some reading to do. Super rad idea August, and I’m excited to meet and learn from some folks. Pleasure to meet you, Joe! So glad you’re enjoying. Thanks for reading, Joe! Your comments are wonderful. You are a great cyber-friend. Shucks. Thanks Renee =) I’m amazed at how y’all create / foster community through blogging. Truly inspirational. Now back to reading more BOAW..
Glad to be a part of today’s fest. Thanks, August. So excited to read al these posts. I wasn’t able to participate this year and I’m already looking forward to being a participant next year. You asked, “How do you define beauty?” I define true beauty when the joyful spirit of a person shines from the inside out. It’s not make-up, clothing, perfume or jewelry. It’s not ‘perfect’ anything — skin, body, hair. Perfection is sharing love and gratitude with others. Beautifully put, Ginger. 🙂 Thanks for being here! Thank you August for bringing so much beauty into the world! I’m getting misty eyed just reading down the list of contributors. I love it! It might take me a day or two, but I’m going to read every single one and comment. And I love that a few men participated as well. Aw. Me too! I may have to get Kleenex to sponsor it next year. 😉 Take your time and enjoy! August, as I still sit here in my bathrobe (10:30 a.m.), I have been reading all the posts. I am now finished and have liked or commented on every one of them. Is this what I do, or do I have to mention all of them here? The only problem was accessing #26 (The Beauty Box). I am not able to access it (won’t open) and my blog (http://allergictolifemybattle.wordpress.com/2013/02/21/the-beauty-of-a-woman-blogfest-ii/) won’t open either. I finally got to read “the beauty box”. Thank. I have thoroughly enjoyed participating and reading all these wonderful posts. I have plans of reblogging some of them on my blog in the very near future. I’m excited to visit these wonderful posts! This was a wonderful thing you did, August. Fantastic. Next year… (I just found out today!) Congratulations! Thanks, Molly! We’d love to have you next year. Wow – there is just so much here. This is an awesome display of beautiful people honoring the beautiful women. Thanks so much for putting this all together. So glad you dig it, Patricia! It’s been a joy for me, too. You’re missed! Love to have you next year, as a reader, contributor or both. 🙂 Hope you’re well, Raani! Aw. Thanks, Ingrid! Means a lot from you. 🙂 Thanks for joining! August, I have read the first one and will try hard to read the others. Do I need to make a comment to you for each post I read if I don’t get to them all? Or is the entry made just by posting? Couldn’t follow that well. I meant to add my own to your list, but didn’t get the time to do it. Hey Scott, Comment on or “like” each blog you read, then come back here and let me know that you’ve visited them all. For that, you’ll get 10 entries. You also get one entry by posting a comment here. We’d love to have you next year. Ok, I will publish here for the one entry by telling you that I enjoyed this post and did read some of them. I have, for once, been really busy this weekend, so I didn’t get them all read. Buy, you have my mind working on this topic. It is reflected a bit in my post for tomorrow. Groovy, Scott! I’d love to read it. I am really enjoying this blog fest August. Everyone’s stories are so inspiring and beautiful. Thank you for hosting this amazing festival! Happy Beauty of a Woman Blog Fest! We should do this more often! Just made it through every single post. Wow. These pieces were delicious. I am do proud to have been included in this wonderful collection! Thank you again for including me! I came back this morning to read those lovely posts that were added later. I have loved every minute and hope you continue next year with Blogfest III. You can count on it, Kathryn! So glad you enjoyed it. 🙂 Thanks for your wonderful contributions. Dang! My internet has been so twitchy. I have really loved what I’ve seen so far. You always host such a great blogfest. Sorry I missed it this time around. Doesn’t mean I value it any less. Just recovering for being “soul-tired.” Thank you for being so beautiful and helping spread the importance of true beauty and worth. Aw. I understand soul-tired. I hope you’re feeling better. Thanks for the sweet support! Kecia Adams wrote a lovely post on this subject. August, this has been a wonderful experience. The patchwork quilt of posts cover so much breadth and depth its hard not to raise our heads high and be proud of the strengths, bravery, compassion, persistence, empathy, dedication and commitment that women bring to the world. Just a lovely experience. I hope you’ll do it again next year. Agreed, Jenny. Thanks for the wonderful support! Wow, there are some awesome posts here. I spent half a day looking at them and it was a wonderful afternoon. So glad you’ve enjoyed, Jennifer! I’m trying to get to everybody’s post but I am such a slow reader. I will read them all though, because every one I have read has been fabulous. Thanks again, so, so much for doing this, August! It has been a great experience. That means a lot, Kassandra, to me and, I’m sure, to all festers. 🙂 It wouldn’t have been the same without you! I’ve made it through all the posts and commented on each one! Such inspiring stories and I love the variety of them! Great festival, August, truly inspiring! August, this has been (continues to be – still reading!) brilliant. I remarked on one participant’s blog today that I didn’t expect to get so much out of the posts. I feel as though I’m having a master class in defining beauty. Inspiring, thought-provoking, humorous, brave, sad… The entire womanly experience, summed up in a little over four dozen blog posts. Magic. August: Just wanted to drop you a note to say that the gift is truly reading these amazing stories of strength and beauty. What a priceless gift. Thank you for hosting. August, I just this week wrote my view of women losing their sense of beauty in this post below. What triggered it was a young lady who is very lovely deciding to get Enhanced.- She really did not need it. Had I written it a week ago I might have submitted it to your BOAW fest. I offer it for your readers thoughts.